After fighting a sore throat and the beginning of the flu, I’m finally on the mend and off to Hossegor for a few days to see Mila who is taking part in the bodyboard French championships. Quite a big thing since she has only recently starting bodyboarding. A part of me is super proud and the other part is a bit freaked out. Last time she took part in a competition (her first), she came 4th which was fantastic but the waves were 1.5m high and the ocean was pretty agitated and this week looks like it’s gonna be the same if not worse so will see. Anyway…I had started my board with this navy coat which is very similar to the one I’m wearing here but then, I came across this beautiful cream coat (2). 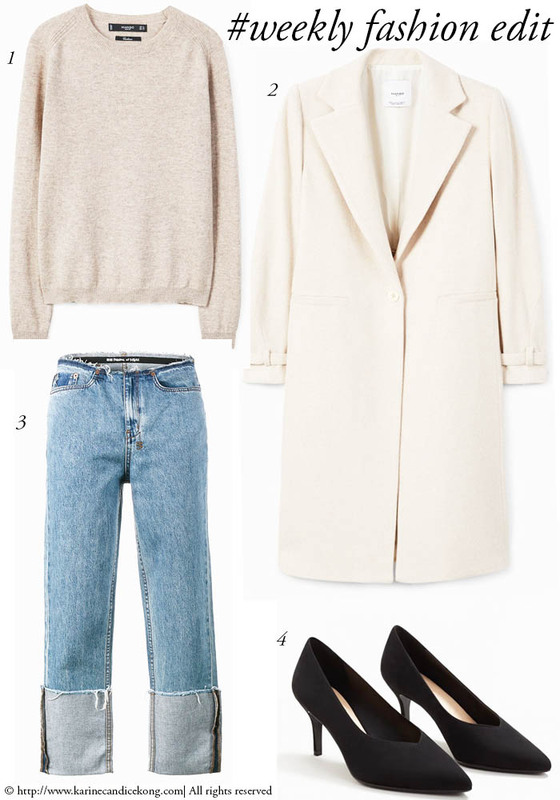 Cream coats always look very chic and this one is perfect to wear over a pair of frayed jeans or wool trousers if you want to go for the cream on the cream look. Given the weather and our needs for warmth, cosy things, I would go for this little cashmere jumper (1) under £100. In wintertime, I don’t think there is a better feeling than wearing a cashmere jumper on bare skin, don’t you!? It’s the little things that make us feel good. I would pair it with these narrow raw hem jeans (3) from Australian label Ksubi and these very affordable black heels (4). And if you missed them, check out my article about these 15 chunky knits to wear for fall and this really beautiful home in the south of Sweden. Follow me on Bloglovin’ or sign up to my E-news to be updated on new blog posts.